Movmnt is here to fill a gap. Every generation looks for something new, fresh, different. An online culture still needs its own magazine. The themes – dance, fashion, music, society – blend into a global aesthetic. The fashion world feeds into the dance community, and vice-versa, while musicians are in eternal motion as our society evolves faster than ever. movmnt is about us – about the urban lifestyle citizen. Joyful and open-minded, concerned and curious. We want to know more, to understand better, to educate ourselves while being entertained. 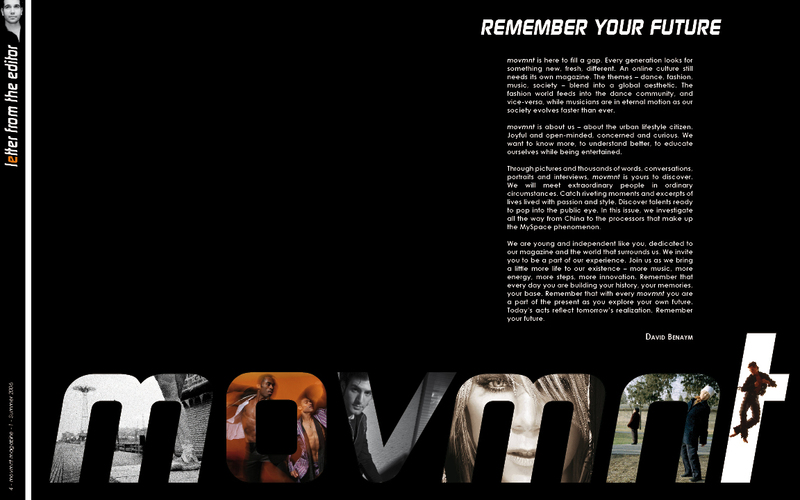 Through pictures and thousands of words, conversations, portraits and interviews, movmnt is yours to discover. We will meet extraordinary people in ordinary circumstances. Catch riveting moments and excerpts of lives lived with passion and style. Discover talents ready to pop into the public eye. We are young and independent like you, dedicated to our magazine and the world that surrounds us. We invite you to be a part of our experience. Join us as we bring a little more life to our existence – more music, more energy, more steps, more innovation. Remember that every day you are building your history, your memories, your base. Remember that with every movmnt you are a part of the present as you explore your own future. Today’s acts reflect tomorrow’s realization. Remember your future.